Picture - A F.32 painted for Universal Air Lines System on September 25, 1929. 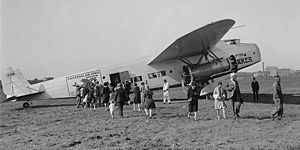 The Fokker F.32 was a passenger aircraft built by the Fokker Aircraft Corporation of America in 1929 in their Teterboro, New Jersey factory. It was the first four-engined aircraft designed and built in the United States. Ten examples were built, but they only entered limited commercial service; their high cost and problems with the cooling of the after engines proved prohibitive. The United States Army Air Force evaluated the F.32 as the YC-20, but did not purchase it. The first F.32 crashed on November 27, 1929 during a demonstration of a three-engined takeoff. One of the two port engines was stopped, but the other failed shortly after takeoff, causing a loss of control. The aircraft came down on a suburban house in Long Island and was totally destroyed in the crash and subsequent fire; remarkably, nobody was killed, although the pilot and a passenger was injured. This crash was witnessed by famous American poet Ogden Nash, who wrote of it to his then fiancee Frances (later his wife). Nash's account is found in "Loving Letters from Ogden Nash: A Family Album" edited by Linell Nash Smith (Nash's daughter). The crash displayed the F.32's most notable problem; it was underpowered, which was made worse by the aircraft's back-to-back engine configuration, with an engine on each end of the underwing nacelles. The front engine powered a two-bladed propeller and the rear engine a three-bladed one. The after propellers, working in the disturbed air from the front, were inefficient, and the rear engines suffered from cooling problems. The underpowering problem was partially solved by replacing the prototype's Pratt & Whitney Wasp engines with more powerful Pratt & Whitney Hornets on later planes, but the other issues remained with the planes throughout their short service lives. Initially, Western Air Express and Universal Air Lines each ordered five aircraft, and there was interest from other airlines, including KLM (Royal Dutch Airlines). However, despite the painting of a prototype for Universal, they cancelled their order, and WAE only picked up two instead of the planned five, largely because of the Great Depression. Western Air Express were the only purchasers of the F.32, buying two of them. They operated out of Alhambra Airport in Alhambra, California and later Grand Central Air Terminal in Glendale, California, flying to Oakland International Airport (Oakland, California) and other West Coast destinations. In 1930, the U.S. Army Air Corps borrowed a F.32 for testing, designating it YC-20. Just as with the Boeing Y1C-18, the aircraft remained the property of the manufacturer and was returned after testing. It was the largest transport aircraft yet trialled by the USAAC and would remain so until the World War II era and such planes as the Douglas C-47. Gunston, Bill (ed.) The Illustrated Encyclopeida of Propeller Airliners. London:Phoebus, 1980. ISBN 0 7112 0062 9.